​The Great Swiss Mountain Dog is considered the oldest of the Swiss breeds and was instrumental in the early development of both the St. Bernard and the Rottweiler. ​There are several theories regarding the ancient origins of the Swiss Sennenhund breeds. 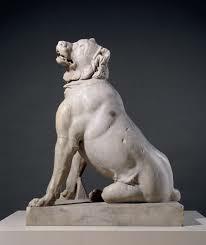 The most popular theory states the dogs are descended from the Mollasian, a large Mastiff-type dog that accompanied the Roman Legions on their invasion of the Alpsin the 1st century B.C. However, a second theory holds that the Phoenicians (c. 1100 B.C.) brought a large breed of dog with them to settlements in Spain, and that these dogs later migrated eastward to influence the development of the Spanish Mastiff, Great Pyrenees, Dogue de Bordeaux, and eventually the large Swiss breeds. ​Yet a third possibility is that a large breed was indigenous to central Europe as far back as the Neolithic period. Whether or not a large breed was already in existence at the time of the Roman invasion of the Alpine regions, it seems clear that the Roman dogs would have been bred with these dogs. As a result, several breeds, including the Greater Swiss Mountain Dog, St. Bernard, and Bernese Mountain Dog, are largely descended from the Roman Mollasian. 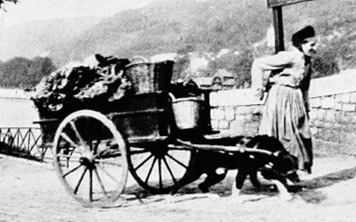 The early ancestors of the Swissy were used by farmers, herdsmen, and merchants in central Europe. Selective breeding was more commonly based on the dog’s ability to perform a particular function, such as pulling loads or guarding, rather than on any acknowledged breed standard. Consequently, a group of dogs bred to perform a certain function took the name of that activity, such as Viehhunde, or cattle dog. 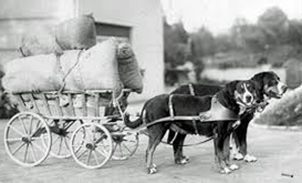 By the 19th century, the ancestors of the modern Swissy were widely used in central Europe by farmers, and tradesmen, and were often referred to as, Metzgerhunde, or “Butcher’s Dogs”. They were large, muscular dogs, some with tri-colored markings, though red/white and black/tan coloring were ​They were large, muscular dogs, some with tri-colored markings, though red/white and black/tan coloring were also prevalent. At one time these dogs were believed to have been among the most popular dogs in Switzerland. However, by 1900 their numbers had severely dwindled. This decrease in numbers is possibly due to the increasing availability of mechanized transport as an alternative to the traditional use of the Swissy as a draft dog. At the 1908 jubilee dog show, held to commemorate the 25th anniversary of the Schweizerische Kynologische Gesellschaft (Swiss Kennel Club or SKG), two entries were described as “short-haired Bernese Mountain Dogs”. In attendance at this event, was Professor Albert Heim, a canine researcher and distinguished expert on the Swiss Sennenhund breeds. Professor Heim recognized these dogs to be members of the large Sennenhund type, and pressed for their recognition as a separate breed. 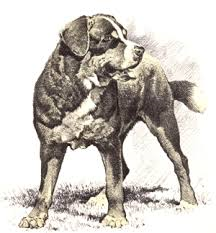 The following year, the SKG listed the Grosser Schweizer Sennenhund (Greater Swiss Mountain Dog) in the Swiss Stud Book. Throughout the early 20th century, the population of GSMD in Europe grew very slowly, and it is still a rare breed both in the US and in its native Switzerland. 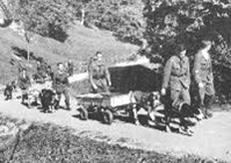 During WWII the breed was used by the Swiss Army as a draft dog and by 1945 it is believed there were approximately 350-400 dogs in existence. In 1968, J. Frederick and Patricia Hoffman, with the help of Perrin G. Rademacher, imported the first Swissys to the US. 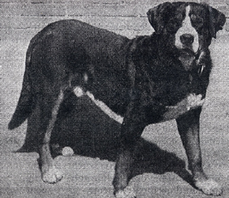 Subsequently, the Greater Swiss Mountain Dog Club of America was formed, with the assistance of Howard and Gretel Summons. Since that time the Club has promoted careful, selective breeding to gradually increase the strength and popularity of the breed. In 1983, the Club held the first GSMDCA National Specialty and the club registry contained 257 dogs. In 1985, the breed was granted entrance to the AKC Miscellaneous Group. In 1992, the GSMDCA started to work toward full AKC recognition. In July 1995, the Greater Swiss Mountain Dog was officially granted full recognition in the AKC Working Group.